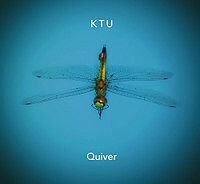 KTU is a project of Trey Gunn, Pat Mastelotto and Kimmo Pohjonen - at the beginning Samuli Kosminen was also part of KTU. Kosminen left the band in 2007, but is still helping KTU as a guest with arrangements and during the recordings. In 2005 their debut 8 Armed Monkey was released which was recorded live in 2004 in Tokyo. With Quiver they now present their first studio album which is again taking you on a musical journey. The instrumental album is creating soundscape with percussion, Warr guitar and accordion. The King Crimsonists joined forces with accordion avantgardist Kimmo Pohjonen. At Kataklasm they show that even this instrumentation can create heavy sounds, but they also bring back the progressive sounds of the 70's spiced up through the unusual instrumentation. At Nano the accordion is more prominent, it dominates the sound.. the song. Very cool! Even if you can hear Kimmo Pohjonen's voice is here and there, the 'vocals' are more in the focus at Purga. One of my favorites is Wasabi Fields which carries you away, while Aorta is kinda loud and demanding your attention. A prog rock frenzy! But quite cool! Another adventure to new soundscapes is Miasmaa... A fascinating travel through the sonic world of KTU is Quiver! If you like avantgarde / prog rock, then check out Quiver!